Tract housing in Colorado Springs. Cul-de-sacs are hallmarks of suburban planning. Row houses in Upper Darby, Pennsylvania, an inner-ring suburb of Philadelphia. A suburb is a mixed-use or residential area, existing either as part of a city or urban area or as a separate residential community within commuting distance of a city. In most English-speaking countries, suburban areas are defined in contrast to central or inner-city areas, but in Australian English and South African English, suburb has become largely synonymous with what is called a "neighborhood" in other countries and the term extends to inner-city areas. In some areas, such as Australia, China, New Zealand, the United Kingdom, and a few U.S. states, new suburbs are routinely annexed by adjacent cities. In others, such as Saudi Arabia, Canada, France, and much of the United States, many suburbs remain separate municipalities or are governed as part of a larger local government area such as a county. In Australia and New Zealand, suburbs (in the wider sense noted in the lead paragraph) have become formalised as geographic subdivisions of a city and are used by postal services in addressing. In rural areas in both countries, their equivalents are called localities (see suburbs and localities). The terms inner suburb and outer suburb are used to differentiate between the higher-density areas in proximity to the city center (which would not be referred to as 'suburbs' in most other countries), and the lower-density suburbs on the outskirts of the urban area. The term 'middle suburbs' is also used. Inner suburbs, such as Te Aro in Wellington, Mt Eden in Auckland, Prahran in Melbourne and Ultimo in Sydney, are usually characterised by higher density apartment housing and greater integration between commercial and residential areas. In the United Kingdom and in Ireland, suburb merely refers to a residential area outside the city centre, regardless of administrative boundaries. Suburbs, in this sense, can range from areas that seem more like residential areas of a city proper to areas separated by open countryside from the city centre. In large cities such as London, suburbs include formerly separate towns and villages that have been gradually absorbed during a city's growth and expansion, such as Ealing or Bromley. The earliest appearance of suburbs coincided with the spread of the first urban settlements. Large walled towns tended to be the focus around which smaller villages grew up in a symbiotic relationship with the market town. The word 'suburbani' was first used by the Roman statesman Cicero in reference to the large villas and estates built by the wealthy patricians of Rome on the city's outskirts. Due to the rapid migration of the rural poor to the industrialising cities of England in the late 18th century, a trend in the opposite direction began to develop; that is, newly rich members of the middle classes began to purchase estates and villas on the outskirts of London. This trend accelerated through the 19th century, especially in cities like London and Manchester that were experiencing tremendous growth, and the first suburban districts sprung up around the city centre to accommodate those who wanted to escape the squalid conditions of the industrial town. Toward the end of the century, with the development of public transit systems such as the underground railways, trams and buses, it became possible for the majority of the city's population to reside outside the city and to commute into the center for work. By the mid-19th century, the first major suburban areas were springing up around London as the city (then the largest in the world) became more overcrowded and unsanitary. A major catalyst in suburban growth came from the opening of the Metropolitan Railway in the 1860s. The line joined the capital's financial heart in the City to what were to become the suburbs of Middlesex. Harrow was reached in 1880, and the line eventually extended as far as Verney Junction in Buckinghamshire, more than 50 miles (80 kilometres) from Baker Street and the centre of London. Unlike other railway companies, which were required to dispose of surplus land, the Met was allowed to retain such land that it believed was necessary for future railway use. [lower-alpha 1] Initially, the surplus land was managed by the Land Committee, and, from the 1880s, the land was developed and sold to domestic buyers in places like Willesden Park Estate, Cecil Park, near Pinner and at Wembley Park. In 1912, it was suggested that a specially formed company should take over from the Surplus Lands Committee and develop suburban estates near the railway. 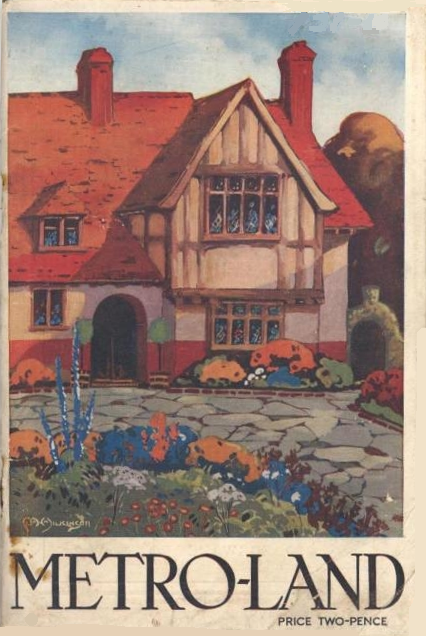 However, World War I delayed these plans and it was only in 1919, with expectation of a postwar housing boom, that Metropolitan Railway Country Estates Limited (MRCE) was formed. MRCE went on to develop estates at Kingsbury Garden Village near Neasden, Wembley Park, Cecil Park and Grange Estate at Pinner and the Cedars Estate at Rickmansworth and create places such as Harrow Garden Village. Virginia Beach and Mesa, Arizona, the two most populous suburbs in the United States, are actually more populous than many of America's largest cities, including Miami, Minneapolis, New Orleans, Cleveland, Tampa, St. Louis, Pittsburgh, Cincinnati, and others. Virginia Beach has exceeded the population of its neighboring primary city, Norfolk. While Virginia Beach has slowly been taking on the characteristics of an urban city, it will not likely achieve the population density and urban characteristics of Norfolk. It is generally assumed that the population of Chesapeake, another suburb of Norfolk, will also exceed Norfolk in 2018 if its current growth rate continues at its same pace. A greater percentage of whites and lesser percentage of citizens of other ethnic groups than in urban areas. However, Black suburbanization grew between 1970 and 1980 by 2.6% as a result of central city neighborhoods expanding into older neighborhoods vacated by whites. By 2010, suburbs increasingly gained people in racial minority groups, as many members of minority groups became better educated, more affluent, and sought more favorable living conditions compared to inner city areas. Compared to the American counterpart, Canadian suburbs are more dense (mostly in major cities), with the Toronto suburb of Mississauga itself being Canada's 6th largest city. Land use patterns in Canadian suburbs are often more mixed-use. There are often high- or mid-rise developments interspersed with low-rise housing tracts and in many suburban areas, there are numerous slab-style residential highrises that were constructed in the 1970s and onward. In Canada, densities are generally slightly higher than in Australia, but below typical European values. Often, Canadian suburbs are less automobile-centred and public transit use is encouraged but can be notably unused. Throughout Canada, especially in Toronto and Vancouver, there are comprehensive plans in place to curb sprawl, such as Ontario's Places to Grow act. This act is intended to manage growth in Toronto's suburbs, including Pickering and Ajax, Markham, Richmond Hill, Thornhill, Vaughan, Bolton/Caledon, Brampton, Mississauga, and Oakville, among others. Population and income growth in Canadian suburbs had tended to outpace growth in core urban or rural areas, but in many areas this trend has now reversed. The suburban population increased 87% between 1981 and 2001, well ahead of urban growth. The majority of recent population growth in Canada's three largest metropolitan areas (Greater Toronto, Greater Montréal, and Greater Vancouver) has occurred in non-core municipalities, although this trend has already reversed itself in Toronto, where a building boom has begun to take place. This trend is also beginning to take effect in Vancouver, and to a lesser extent, Montréal. In certain cities, particularly Edmonton and Calgary, suburban growth takes place within the city boundaries as opposed to in bedroom communities. This is due to annexation and large geographic footprint within the city borders. British television series such as The Good Life, Butterflies and The Fall and Rise of Reginald Perrin have depicted suburbia as well-manicured but relentlessly boring, and its residents as either overly conforming or prone to going stir crazy. Contrastingly, U.S. shows – such as Knots Landing, Desperate Housewives and Weeds – portray the suburbs as concealing darker secrets behind a façade of perfectly manicured lawns, friendly people, and beautifully up-kept houses. Films such as The 'Burbs, Disturbia and Hot Fuzz, have brought this theme to the cinema. This trope was also used in the episode of The X-Files "Arcadia" and on one level of the video game Psychonauts. ^ a b Hollow, Matthew (2011). "Suburban Ideals on England's Interwar Council Estates". https://www.academia.edu/1593132/Suburban_Ideals_on_Englands_Interwar_Council_Estates. Retrieved 2012-12-29. ^ "Suburb boundaries - a Official Information Act request to Christchurch City Council" (in en). FYI. 2018-03-30. https://fyi.org.nz/request/7543-suburb-boundaries. ^ "Request for the New Zealand Localities dataset". September 2014. http://www.ombudsman.parliament.nz/system/paperclip/document_files/document_files/885/original/179451_-_request_for_nz_localities_dataset.pdf?1413915614. ^ "Luoyang and the Northern Army". http://the-scholars.com/viewtopic.php?f=5&t=23989. ^ a b "History of Suburbs". http://www.infoplease.com/encyclopedia/world/suburb-history-suburbs.html#ixzz2IqMC5s34. Retrieved 2012-12-17. ^ "History of London Metro-Land and London's Suburbs". http://www.history.co.uk/explore-history/history-of-london/rambles-in-metro-land.html. Retrieved 2 January 2018. ^ (2000) "The suburban aspiration in England since 1919". Contemporary British History 14: 151–174. DOI:10.1080/13619460008581576. ^ "The History of the Suburb". http://www.hgstrust.org/the-suburb/history-of-the-suburb.shtml. Retrieved 2 January 2018. ^ "Outcomes of the War: Britain". http://www.bbc.co.uk/schools/worldwarone/hq/outcomes1_02.shtml. Retrieved 2 January 2018. ^ Lofthouse, Pamela (2012). "The Development of English Semi-detached Dwellings During the Nineteenth Century". Papers from the Institute of Archaeology 22: 83–98. DOI:10.5334/pia.404. Retrieved on 17 March 2013. ^ "Suburban Ideals on England's Interwar Council Estates". https://www.academia.edu/1593132/Suburban_Ideals_on_Englands_Interwar_Council_Estates. Retrieved 2012-12-17. ^ Ward David (1964). "A Comparative Historical Geography of Streetcar Suburbs in Boston, Massachusetts and Leeds, England: 1850–1920". Annals of the Association of American Geographers 54 (4): 477–489. DOI:10.1111/j.1467-8306.1964.tb01779.x. ^ "Zoning Requirements for Standard Lot in RS3 District" (in English). Archived from the original on 14 August 2014. https://web.archive.org/web/20140814060758/http://chicago47.org/zoning-requirements-for-standard-lot-in-rs3-district/. Retrieved 27 April 2017. ^ a b Jackson, Kenneth T. (1985). Crabgrass Frontier: The Suburbanization of the United States. New York: Oxford University Press. ISBN 0-19-504983-7. ^ Barlow, Andrew L. (2003). Between fear and hope: globalization and race in the United States. Lanham, Maryland (Prince George's County): Rowman & Littlefield. ISBN 0-7425-1619-9. https://books.google.com/?id=2gJhgr0BrooC&printsec=frontcover. ^ Noguera, Pedro (2003). City schools and the American dream: reclaiming the promise of public education. New York: Teachers College Press. ISBN 0-8077-4381-X. https://books.google.com/?id=bfuFosKIPeEC&printsec=frontcover. ^ Naylor, Larry L. (1999). Problems and issues of diversity in the United States. Westport, Conn.: Bergin & Garvey. ISBN 0-89789-615-7. https://books.google.com/?id=y7-EyumYyCUC&printsec=frontcover. ^ "Dependence on cars in urban neighbourhoods". Government of Canada. Archived from the original on 17 September 2016. https://web.archive.org/web/20160917183546/http://www.statcan.gc.ca/pub/11-008-x/2008001/article/10503-eng.htm. Retrieved 27 April 2017. ^ London's metroland. Transportdiversions.com. Retrieved on 2011-11-22. ^ "(Mis)understanding China's Suburbs". China Urban Development Blog. 2011-02-23. http://www.chinaurbandevelopment.com/?p=499. Retrieved 2013-02-25. ^ "Is This Beijing's Suburban Future?". The Atlantic. 2011-02-10. https://www.theatlantic.com/international/archive/2011/02/is-this-beijings-suburban-future/71017/. Retrieved 2013-02-25. ^ Ruth McManus, and Philip J. Ethington (2007). "Suburbs in transition: new approaches to suburban history". Urban History 34 (2): 317–337. DOI:10.1017/S096392680700466X. ^ Mary Corbin Sies (2001). "North American Suburbs, 1880–1950". Journal of Urban History 27 (3): 313–46. DOI:10.1177/009614420102700304. ^ "Chanson francaise La banlieue 1931-1953 Anthologie". http://www.fremeaux.com/index.php?page=shop.product_details&category_id=74&flypage=shop.flypage&product_id=506&option=com_virtuemart. Retrieved 2 January 2018. Jackson, Kenneth T. (1985). Crabgrass Frontier: The Suburbanization of the United States. New York: Oxford University Press. ISBN 0-19-504983-7. This page uses content from the English language Wikipedia. The original content was at Suburb. The list of authors can be seen in the page history. As with this Familypedia wiki, the content of Wikipedia is available under the Creative Commons License.